The day started with oil bath, prayers to god and blessings from parents. Then we had the special Ugadhi Pachadi. I like the pachadi for the concept behind it. The Pachadi is a mixture of six different tastes and it symbolizes the fact that life is a mixture of different experiences (sadness, happiness, anger, fear, disgust, surprise) , which should be accepted together and with equanimity. Ugadhi Pachadi is a mixture of Neem flowers (for bitterness) , Raw Mango (for tang), Tamarind juice (for sourness), Chilly powder (for spice), Jaggery (for sweetness) and Salt (for saltiness). And we made Obbattu(Paruppu Poli) and Mango Vada(fritters) as prasadam. You can find the Mango Vada(Fritters) recipe here. Take maida, salt and cooking soda in a bowl and mix well adding adequate water to it and make a smooth dough. It should be a little softer than chapthi dough. Now smear 2 tblsp of cooking oil on top of the dough and cover it with a plate. Keep it aside for 3 hours. Cook bengal gram dhall in pressure pan. Now grind it along with jaggery and cardamom into a very thick paste. Now take a pan and add 2 tsp of ghee and the ground paste. Keep mixing it tell it becomes thick and well cooked. Once done, let it cool for a while and then roll out small balls of the filling. Take a plastic coated paper/butter paper/Banana leaf and grease it with oil. Now take a small portion of the maida mixture and spread it with your fingers. Now place the filling ball in it and cover it nicely with the maida mixture. Once again flatten it well using your fingers into a round shape. Cook on hot tava until golden brown on both sides. Happy Ugadhi to you too!! Both the dishes look delicious. Happy Ugadi to u too....poli is my fav! Happy Ugadi to you too Nithya!! Happy ugadi nithi... wishes to all of them too. Everything looks so good and I would be happy to eat it without making. Yummy !!!! Small pillayar is looking very cute. Happy Ugadhi to you Nithya. All dishes look great. I like that Poli a lot. I wish I could have a piece of that. One will get into a festive mood when looking at your pictures !!!! Hope you had a lovely day with your family. 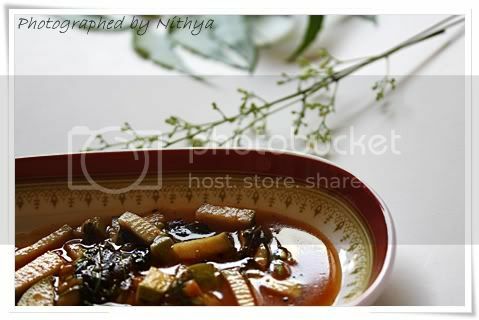 Obbattu looks yummm....I love to have it hot along with ghee :). Happy Ugadi to you & family !! Wish you a very very happy Ugadi to you and your family. Looks gorgeous Nithya! Your SLR is beginning to work overtime - and we all love it! wow! 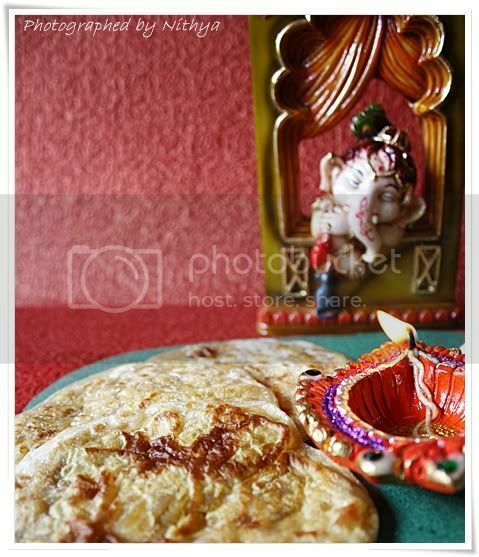 Lovely i love that poorana poli ..pass me dear here! 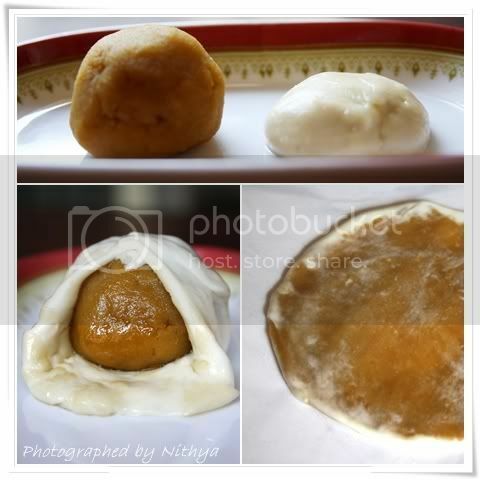 Happy Ugadhi...poli is one of my fav item which i miss very much.. 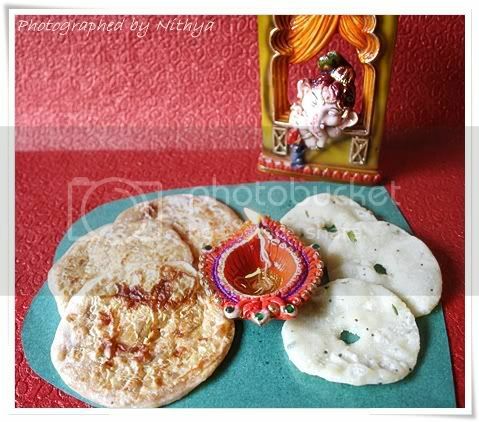 Happy Ugadi.wishing you awonderful year ahead.This dish looks lovely nad beautiful presentation and clicks. Hope U had a great time,Nice clicks Nithya! Loved the Obbuttu very much ,looks soft as well as perfect!